With the launch of iPhone 8 and 8 Plus, Apple introduced its smartphone user base to fast charge technology capable of delivering an up to 50 percent charge in just 30 minutes. AppleInsider takes a closer look at the technology and how it compares to traditional — and wireless — charging methods in this video. In order to take advantage of the new fast charge feature, users will need a few extra pieces of hardware that don't come included in an iPhone 8 box. First, a USB-C to Lightning Cable adapter that supports USB Power Delivery (USB-PD) is needed to connect an Apple 29-watt, 61W or 87W USB-C power adapter to your iPhone 8. Alternatively, third-party USB-C power adapters that support the same specification can also be used as a stand-in for Apple's branded accessories. For our test, we'll be taking a look at Apple's 29W charger, the 12W adapter included with the latest iPad Pro models, the 7.5W Belkin Boost Up wireless charger marketed in Apple stores and the 5W adapter included with all iPhone 8 models. In addition, we also evaluated direct charging from an iMac using both a USB-C to Lightning cable and a USB-A to Lightning cable. Before looking at the results, it should be noted that there is no material difference in charging speed between Apple's 29W and 87W USB-C chargers. If you're buying an Apple branded charger specifically to charge your iPhone, save some money and go with the 29W version. The first step in our test involves depleting iPhone 8 Plus' battery until the device shut down. We then plugged the handset into the selection of adapters mentioned above and recorded onscreen battery charge indications at regular intervals. After five minutes, the fast charging method involving Apple's 29W adapter takes an early lead with iPhone showing a 9 percent charge. Trailing behind at 7 percent charge is the 12W adapter, while USB-C from an iMac stands at 6 percent. The gratis 5W adapter manages an only 4 percent charge after the same 5 minute period. At the 15 minute mark, the fast charger reached 29 percent, extending its lead over the 12W charger's 19 percent. Interestingly, the USB-C to iMac method followed close behind at this point with an 18 percent charge. After 30 minutes, the USB-C fast charger exceeded its promised charging rate at 52 percent, while the 12W ended at 36 percent. Not a huge difference, but definitely noticeable. The USB-C to Lightning cable plugged into our iMac was just behind the 12W adapter with 34 percent charge, while the USB-A to iMac was slower at 26 percent. The wireless charger and 5W adapter finished the 30 minute run with about 20 percent charge, less than half what USB-C can achieve. Moving to one hour, our fast charger system gained an additional 28 percent over the ensuing half hour. It's clear Apple's power controller ratchets down charge rates after 30 minutes. Our 12W adapter and USB-C to iMac setup gained about 34 percent over the same time period, but still lagged behind in total charge. The wireless device and 5W adapter increased by 20 percent to end the hour at about 40 percent, while USB-C to lightning inched up from 27 percent to 53 percent. It took an additional half hour, or one and a half hours total, for the fast charger to completely charge our iPhone 8 Plus. The 12W and USB-C to iMac connection needed only 15 minutes longer to top up. Even though the included USB-A to Lighting cable plugged into our iMac was at first noticeably quicker than the 5W adapter, it started slowing down and finished only 10 minutes ahead. Wireless charging is currently just as slow as the included 5W adapter, both charging at a consistent rate of about 10 percent every 15 minutes. 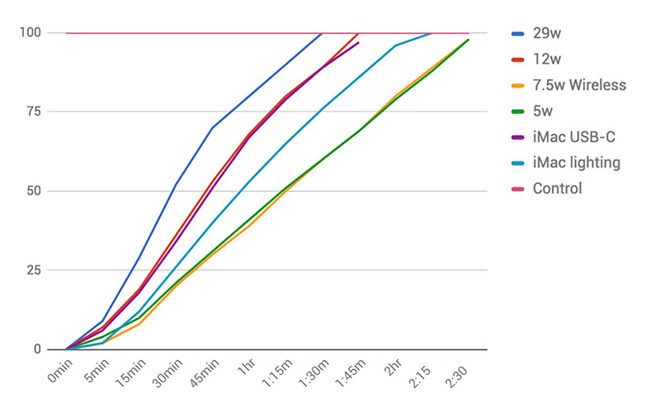 In total, it took 2.5 hours to achieve a full charge on both 5W and wireless methods. This should come as no surprise, as iPhone 8 only accepts 5 watts of power when charging wirelessly. 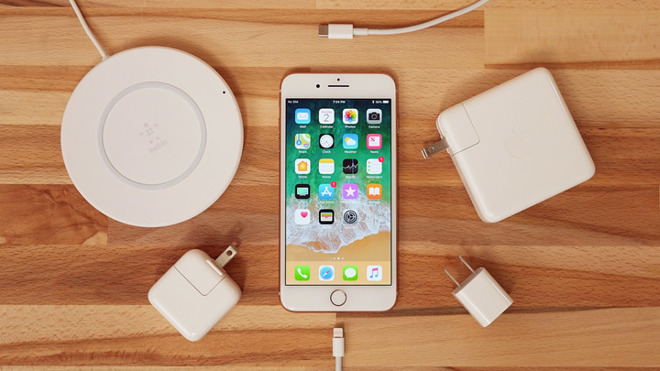 Apple plans to boost wireless charging speeds with a future software update, bringing power transfer rates up to 7.5W, the peak output of Belkin and Mophie chargers sold in the company's stores. If you need the fastest charge possible, use the right USB-PD charger and cable, especially in the first half hour. That said, the same USB-C to Lightning cable plugged into an iMac or an iPad charger yields performance that isn't that far off from the standalone 29W adapter. If you want slightly quicker speeds than the included 5W adapter, but don't want to spring for a separate accessory, plug that same cable into a USB 3.0 port on a Mac. Finally, if you care about speed over convenience, you'll want to stay away from wireless chargers, at least until Apple updates its firmware.